Whether you are looking for a unique tote bag or laptop sleeve you have come to the right place! Our recycled rice sack products are sturdy and come in a variety of colors. Click on an image for more details and options. ​Pimonpum Artwijit (P’Pan), 41, was born in a village in eastern Thailand village and moved to Maepang after marrying. She has no children and lives with her husband. She has worked for Warm Heart for about two years making tote bags, yoga bags and laptop sleeves for the rice sack collection and, more recently, denim shoulder bags. 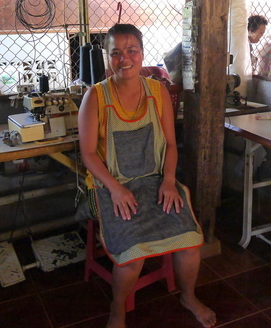 Her family´s income comes from her husband's farm and her small sewing workshop. Besides working for Warm Heart, P’Pan also takes orders for children's uniforms. She prefers being self-employed because of the greater flexibility it allows. P’Pan says working with the rice sack material is difficult because she can´t make any mistakes when she sews because it leaves holes in the material. That´s why she prefers making the denim bags where she can resew if she makes a mistake the first time.